Kenji Mizoguchi's "Sansho the Bailiff" (1954) is one of the greatest films ever made, but that's not really the kind of claim you can build an argument around. So allow me to refine the claim a bit and state simply that the film's final scene provides one of the greatest and most profoundly moving endings in cinema history. To understand the ending, of course, you need to know the beginning. "Sansho the Bailiff," adapted from a well-known story by Ogai Mori, depicts a world of unrelenting cruelty, an 11th century Japan in which only a handful of wealthy landowners possess human rights of any kind, or, as the opening credits describe it: "an era when mankind had not yet awakened as human beings." Everyone else is mere chattel, to be worked, siphoned dry, and disposed of at the whim of those in power. Zushio (Yoshiaki Hanayagi) and his sister Anju (Kyoko Kagawa) have it relatively easy as kids. Their father, Masauji (Masao Shimizu), is a provincial governor beloved by his peasants for his gentle and compassionate rule. Those same qualities fail to earn the respect of Masauji's masters, and he is eventually sent into exile. His family is forced into exile as well, though separated from the father. When the story picks up later, the mother, Tamaki (Kinuyo Tanaka), leads the children, now nearing adulthood, to reunite with their father after many years apart. Tamaki has always told her children what a great man their father is, and the ebullient kids can't wait to see him. Consider that the "once upon a time" portion of our fairy tale, the part where great promise still lingers and innocence endures, soon to be crushed by reality. In an unbearably vicious scene, brigands rip the children from Tamaki's arms to sell them to slavery; she is spirited away by boat to a fate perhaps even grimmer. 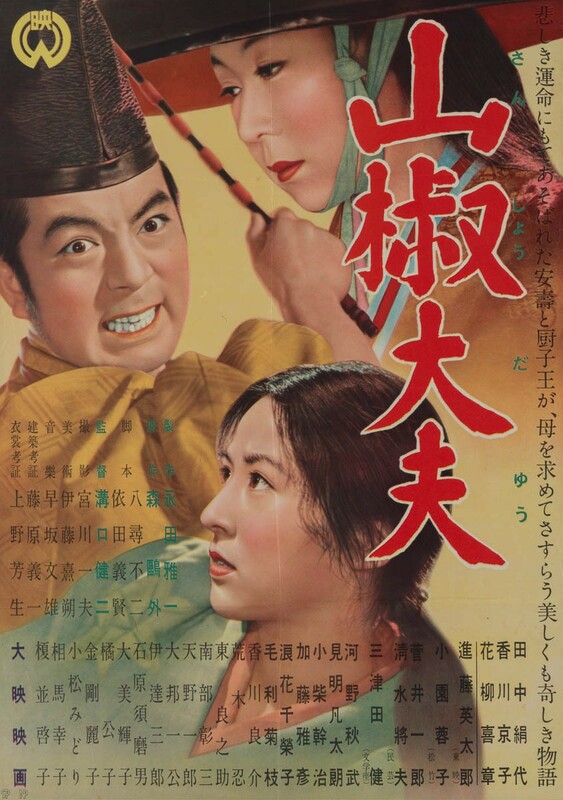 The siblings manage to stay together even after they are sold into the service of the title character, the sadistic Sansho the Bailiff (Eitaro Shindo). Life under Sansho's iron thumb is truly miserable, which makes him a much more popular provincial governor with the big bosses than Masauji ever was. Sansho enjoys free reign to abuse his peasants anyway he sees fit, branding them, sending them out into the woods to die when they get sick, and exploiting them in any possible. Just as long as he collects revenues. 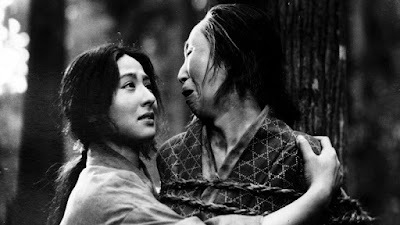 By now you might be expecting a tale of two innocent souls tormented to their breaking point, but here Mizoguchi and screenwriter Yoshikata Yoda offer an intriguing twist on the Mori tale. Anju adapts to unbearable conditions by working hard and keeping out of trouble. Zushio, however, adapts by performing some of the dirtiest jobs in the village, including meting out punishment to his fellow slaves in order to curry favor with Sansho and his cronies. But just when Zushio appears to have forgotten his father's compassionate teachings, he is saved by his sister's compassion and selflessness. Zushio's life as a free man (or what passes for a free man in 11th century Japan) is just as troubled as his life as a slave, but now he sees the world more clearly, through his father's eyes. Zushio becomes a provincial governor in his own right, but sets aside the mantle of power almost as soon as he receives it. He has only one goal in mind, to find his mother. It seems impossible that Tamaki could have survived, and even if she had, his chances of finding her are infinitesimal. In such a dark world, a world before men had yet "awakened", there is absolutely no reason to expect a happy ending. And yet in this film where, in an inversion of the Hollywood formula, the sad ending would have been the easy, formulaic way out, we witness a genuine miracle. As the dogged Zushio zeroes in on his mother's last known whereabouts, his final hope is dashed when he is informed that her village was wiped out by a tsunami. His quest is over. Just then, he hears a plaintive voice warble out a tune: "Zushio, how I long for you. My Anju, fly away." It is a song he has heard before in childhood, and later whispered as a rumor. He sees a blind old woman sitting on the beach, barely aware of her surroundings. He listens to her for a while, then drops to his knees, sobbing. "It is I, Zushio." She believes him to be an evil spirit sent to torment her even more in a life that has been filled only with torture. He finally convinces her of his identity, and, with a few considerate lies, promises her the happiness she has been denied since the moment her children were torn from her. It is perhaps the single most devastating scene I have ever watched. In the final shot, the camera pulls back a great distance and from a high angle to show the tiny mother and son embracing in a desolate landscape, an image that lingers in the mind forever. If you are not moved to tears by it, even after multiple viewings, perhaps you aren't awakened either. Is it the greatest endings of all time? The final moments of "2001: A Space Odyssey,” "Stroszek," and “Au hasard Balthazar” rival it for me, but none clearly surpass it. I know that if this scene alone was the only notable feature of the film, "Sansho the Bailiff" would still be a masterpiece. Fortunately, the rest of the movie holds up pretty well in its own right. The film is presented in its original 1.33:1 aspect ratio. Criterion's 2007 SD transfer was strong enough in its own right, and this 1080p transfer represents the expected upgrade. He black-and-white contrast is deep and rich, and the image resolution is sharp in most scenes, though we get the occasional soft image or scene, likely due to the source print. It isn't absolute top-of-the-line for Criterion, but nobody will be complaining. The linear PCM Mono track is not particularly dynamic, but it has a hollow quality that is very evocative at times, particularly with mother's plaintive song. There are no audible distortions or other audio damage. Optional English subtitles support the Japanese audio. The extras are all imported from Criterion's 2007 SD-DVD release. The film is accompanied by a commentary track by Japanese literature professor Jeffrey Angles, who focuses just as much on the Ogai Mori source material as on the film. The rest of the extras consist of three interviews, with actress Kyoko Kagawa (10 min. ), critic and historian Tadao Sato (24 min.) and Tokuzo Tanaka (15 min) who served as first assistant director to Mizoguchi. The hefty 80-page insert booklet begins with an essay by professor Mark Le Fanu, but the bulk consists of translated versions of the "Sansho" story including the Ogai Mori tale that Mizoguchi and Yoda adapted, and a very different version titled "An Account of the Life of the Deity of Mount Ikawi" which focuses more on Anju. 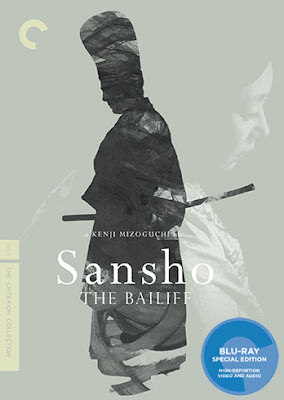 “Sansho the Bailiff” is generally considered Mizoguchi's masterpiece, though there are certainly plenty of other contenders. I won't argue with the consensus. This Criterion Blu-ray may not be as packed with extras as we might want for a film of this stature, but the high-def transfer is strong and the extras are solid enough. “Sansho” is a must-own for any serious film buff, making this an obvious and essential addition to any home theater library.